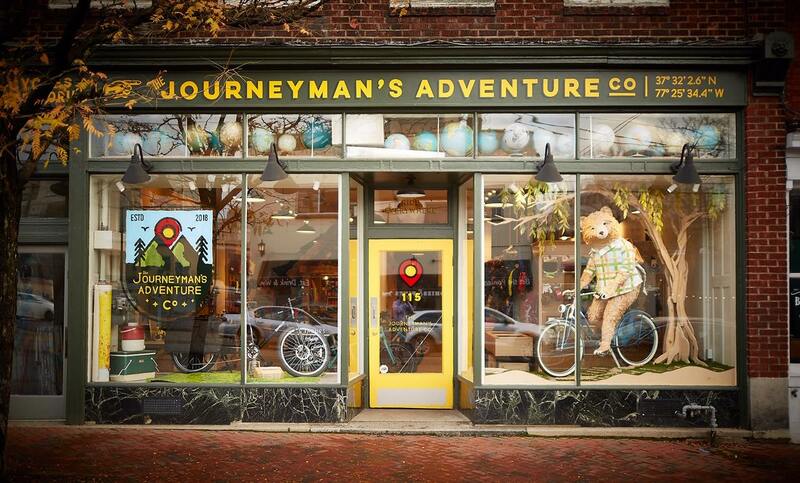 Bike Lovers: Journeyman’s Adventure Co. Grand Opening today! We want YOU to come and celebrate the Grand Opening of the shop in our shiny new space. Look forward to yummy food, live old-time mountain music, Paw paw infused home brew, and groovy give-a-aways. We sat down around a year ago with Glenn Amey the owner of Shift Bicycles and discussed his desire to expand his shop. His passion for ridding and his belief that everyone should arrive everywhere by bike was contagious. It hit us that this should not just be another bike shop but something much more needed. Our goal has been to make a place that adventure seekers and future explorers of all ages feel welcome. I thought for a second I was looking at a a screenshot of a Wes Anderson movie.